If you need to boost your protein, meat is a great place to start. These 3 sources will give you more protein per serving than any other! Whether you're trying to build muscle, lose weight, or just eat a healthier diet, you can probably benefit from a little more protein throughout your day. This powerhouse nutrient is critical for muscle growth and recovery, but it also helps keep you full and takes the most energy to digest of all the macronutrients, making it great for fat loss! Alongside protein supplements, meat is an excellent source of protein and a great starting place to begin upping your protein. However, not all meats are created equal. If you're looking to get the most protein per bite, you need to add these three meats to your grocery list today! The key word you want to look for when seeking out a lean cut of protein is "loin." The word "loin" is synonymous with "lean." And in the case of pork tenderloin, "loin" is also akin to delicious! You won't find a leaner meat with this much protein per bite. Need to Know: By helping to break down muscle tissue, soaking your chops in brine can bring more tender meat to the dinner table. Simply cover your pork in a brine made with 1/4 cup salt to 4 cups of water. (Use enough liquid so that the meat is completely submerged.) Cover and chill for 30 minutes to 2 hours before cooking! There's a reason chicken is a classic bodybuilding staple food. It's packed in protein and low in fat—assuming you remove the skin, of course. Even better, it's cousin, turkey, packs the same protein per pound, so if you're looking to change up the taste, you can switch between these phenomenal cuts of poultry. Need to Know: Like pork chops, chicken breast and turkey breast can benefit from a precook brining. If you're concerned about antibiotic use in large-scale poultry farming, you can look for turkey breast labelled "antibiotic-free." Steak round provides the perfect balance of flavor and protein. This cut is taken from just inside the hind leg, meaning it's a bit juicier than the tougher cuts of meat that come from a more muscle-laden leg. Round manages to provide one gram of protein for every 7 calories, whereas fattier cuts of beef, such as rib eye, delivers roughly 1 gram of protein for every 11 calories. Tender, delicious, and significantly lean! Oh, and did I mention that round happens to be one of the more price-friendly cuts of beef? It's what's for dinner! Need to Know: Leaner cuts of steak like round and loin will become drier than the Sahara with overcooking, so prepare them quickly over high heat to just medium-rare. Try smothering with salt, pepper, and garlic powder before laying them atop a searing hot pan or open flame. Looking for other protein-packed foods? 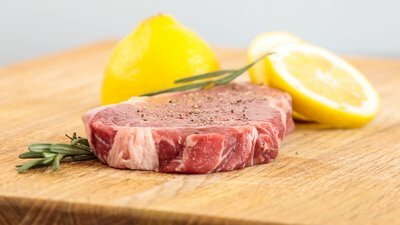 Check out the 5 Best High-Protein Cuts of Steak and The Ultimate List of 40 High-Protein Foods!